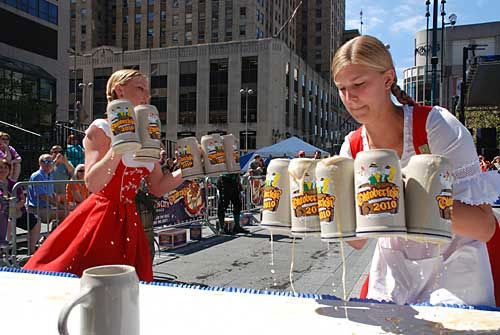 Every September the bountiful local population of Germans, and wanna-be Germans gathers in Cincinnati to celebrate Oktoberfest-Zinzinnati, the largest Octoberfest in the country, and second largest in the world! This year’s events will be held the weekend of September 22, and 23. Not only is there plenty of beer, wurst and sauerkraut, but lots of opportunities for fun events. The world’s largest chicken dance, beer stein roll, and the running of the wieners (dachshunds) are just a few of the acitivites scheduled for the weekend. Visit the official Oktoberfest-Zinzinnati website for all the details! Whether you’re planning to host your own Octoberfest, or visit Munich for the original Octoberfest, Cappel’s has lots of Octoberfest party supplies; hats, lederhosen, flags, rubber chickens, and more. Check us out! The Germans are giving the Irish a run for best party-ers!